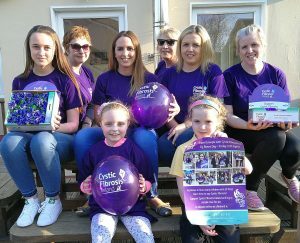 A PORTLAOISE mother has organised a local fundraising event for Cystic Fibrosis Ireland’s 65 Roses Challenge, which will take place in the local Kyle Shopping Centre. Louise Lynam is mother to seven-year-old Kiera, who suffers from cystic fibrosis (CF). Two years ago, the Make a Wish Foundation arranged for Kiera to meet her favourite princesses in Disneyland Paris. And last June, Kiera featured in local news once again, when she was approved for the CF drug Orkambi. Mum Louise said: “We will be in the Kyle Shopping Centre at the new Dunnes Stores in Portlaoise selling cystic fibrosis items on Friday 12 April from 9am until 6pm. We have hundreds of beautiful purple roses, pens, key rings and balloons for the children. The term 65 Roses originates from 1965, when four-year-old Ricky Weiss from Montreal overheard his mum Mary, who was fundraising for CF. Young Ricky, however, pronounced cystic fibrosis as sixty-five roses. The term stuck and 50 years later it’s often used by young children to pronounce the name of their disease. “Kiera started on Orkambi last June and they seem to be working for her, thank God. She was quite sick last October, though, and was hospitalizsed for several nights. During this time, I realised how Orkambi is working for her, as when she would get sick with really bad chest infections previously, she couldn’t get the sticky mucus up from her lungs. It would take long hours of physiotherapy and a nebuliser to shift it. The group thanks management at Kyle Shopping Centre for giving them the opportunity to fundraise, along with everyone in advance for any support they may give on the day.